What do you call Harley Quinn after a dinner of beans on toast? Harley Quinn was undercover pretending to be homeless, and now she’s captured by cannibals on a pile of fetid human bones, wearing her familiar bustier and skin-tight leggings. I guess that was under the homeless garb? Homeless Harley is sort of like Superman’s Clark Kent, she can roam about relatively inconspicuously until the time is right to strike, except that Harley Quinn can’t do anything inconspicuously. While the cannibals are distracted by a bazooka-toting Red Tool at the front door, however, Harley can free herself on the jagged jawbone of a discarded skull, which happens to belong to that ol’ Coney Island institution of smelly ambling, the Skipper. In Harley’s head, at least. Once free, Harley finds a cabinet full of hammers, saws, knives and axes…everything she needs to get a-butcherin’! 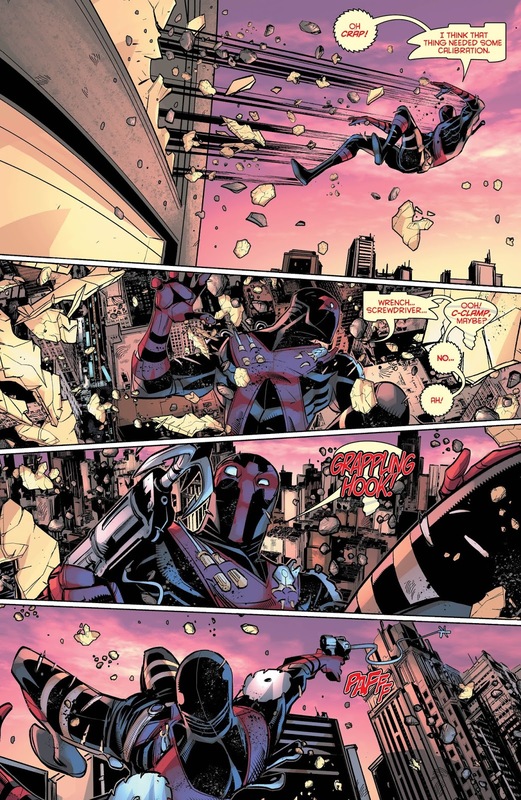 Red Tool fires the bazooka at close range, which sends him propelling into a sequence of events that fairly well takes him out of commission. He has enough wherewithal to call Chief Spoonsdale and have him head over to the cannibals’ house and rescue Harley…or hopefully before Harley eviscerates every one of them. Speaking of the cannibals, they’re arguing with the mayor’s assistant Madison, who wants them to clear out of New York now that they’ve supped on a suitable sum of homeless folk. They feel differently, and are prepared to make a point of it by eating Madison when Harley shows up…and kills everyone. It’s a great scene of bloody carnage, with the result being the death of every cannibal. Harley even eats the eyeballs out of the head cannibal’s head, which is sort of ironic when you come to think of it. Madison Berkowtiz tries to slink away, but Harley drops dime on her and…well, nothing will come of it politically, most likely, the mayor doubtlessly has lots of plausible denial ready for this sort of situation. The important thing is that the secret relationship between Chief Spoonsdale and Harley Quinn is intact, I suppose. And hey, Eggy shows up at the end! I like that guy. In the back-up, Batman has trailed Joker and Harley to their lair, which has a giant Martian Popping Thing! I was so happy to see this, it’s like one of my favorite things ever. They fight, then the jackals are let loose on Batman, and Joker and Harley make their escape in the Jokermobile (which is like one of my second favorite things ever). 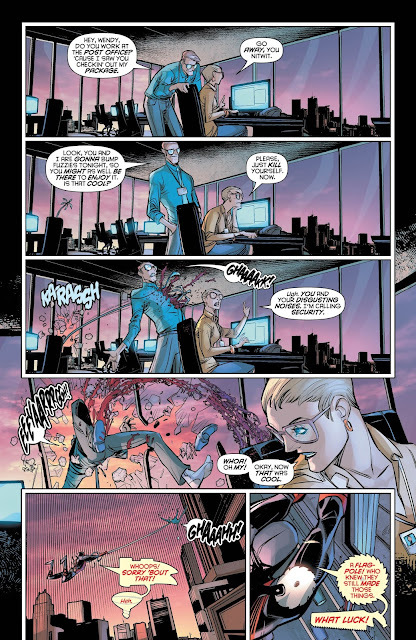 Joker is about to blow up the place, but Harley begs that he avoid hurting her jackals. 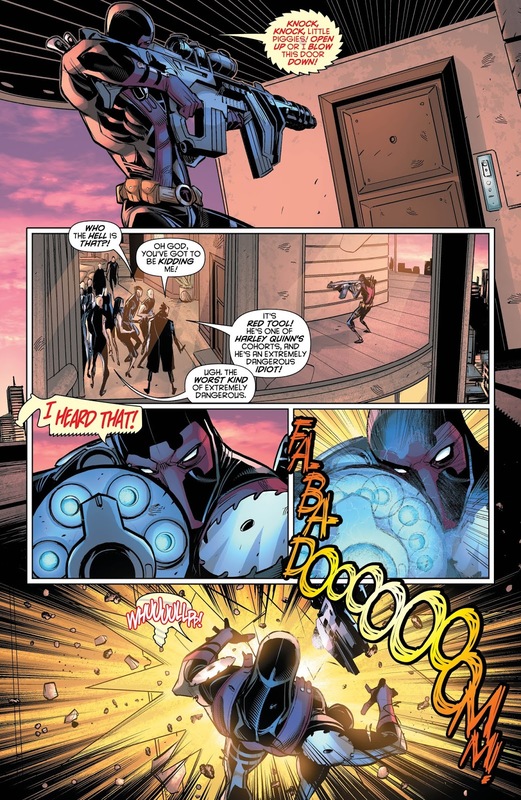 They coincidentally run out of the lair just as Harley bumps the detonation button and accidentally blows up the place, so Harley thinks he waited until they were safe when really, he had nothing to do with it. Batman also gets away as the building explodes, but you could have guessed that. In the end, Joker says he’s gonna take Harley to a hotel! Must be their anniversary. It might have also been worth mentioning that Harley Quinn was in a pink see-through nightie during that whole scene, which made things plenty risqué. It was sort of dull otherwise, though, and I struggle to know what this back-up business is all about. It is helping the main story, which was well-paced and full of gory limb-wrenching greatness as Harley Quinn is known to deliver. The ending to this arc was a little clumsy, but I enjoyed it enough and really liked the character moments at the end. 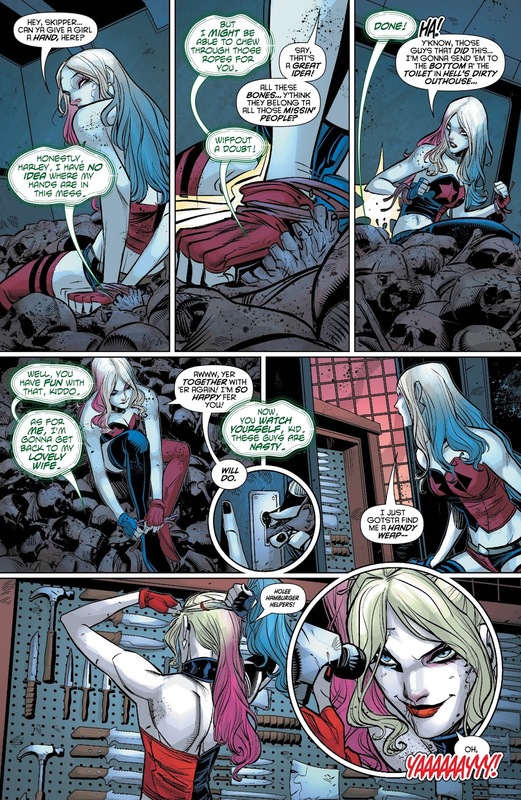 These sick sociopaths that hang around Harley Quinn’s apartment building on Surf Ave….they really care about each other. I think. The cannibal story wraps up here, and it's pretty satisfying in terms of character moments. in terms of hideous flesh-eaters getting their comeuppance it's also pretty sweet. The back-up story is pretty flat, but its inclusion has really been helping the main story in the past few issues. 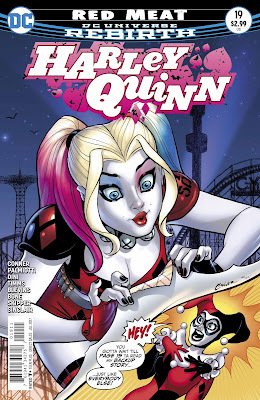 If Harley Quinn keeps up this kind of pacing and comedy, then this book will be back on track for Harley lovers. Actually i have to confess, ive been enjoying harley quinn's adventures, even in the DC YOU era.. id rather read this fun book rather than justice league right now..
well that should go without saying!